Tennessee emo punk idols Paramore are back with some old faces, a tweaked lineup, and a brand new pair of nostalgia glasses on their new song and video "Hard Times." As many fans already know, the last few years have been pretty rocky for the band: Despite having one the biggest albums of their career with the 2013 self-titled album, which even earned them their first Grammy Award, the band was on the brink of imploding thanks to internal strife and departing band members. The future was uncertain for the adored punk band, but now they've seem to come out of the troubles stronger than eve,r with a revamped 1980s-esque sound that's noticeably different than their RIOT! days. Hayley Williams, the first musician crush for a generation of Warped Tour fans, has traded out her iconic red hair for a platinum blonde look, but still has that punk rock charisma we've always loved. Even while original bassist Jeremy Davis left the band in 2016, original drummer Zac Farro is back on the kit for the first time since 2011, so it's nice to see part of the old band still together. The song itself is a pretty big departure from the band's pop-punk sound, which is always bound to disappoint a subset of the core fanbase who still want to party like it's 2007. It's fine if you want to relive the old emo scene that revolved around the Hot Topic at your local strip mall, but the reality is that we can't be 15 forever, and thankfully Paramore is well aware of that. Instead of resting on their laurels and writing angsty teen punk songs in their 30s, the band is actually trying to grow as artists and try out different styles, which is honestly a great thing to see. This new 80s sound is super catchy and upbeat, which is a unique contrast to Williams' candidly bleak lyrics about the struggles of navigating the trials life throws at you. It's a song that actually has more substance than it initially lets on, all while still being a well-crafted earworm that you won't mind having stuck in your head. Plus, the playful, neon-drenched video harkens back to the classic days of MTV, making it a perfect companion to the bright dance-pop influenced sound. 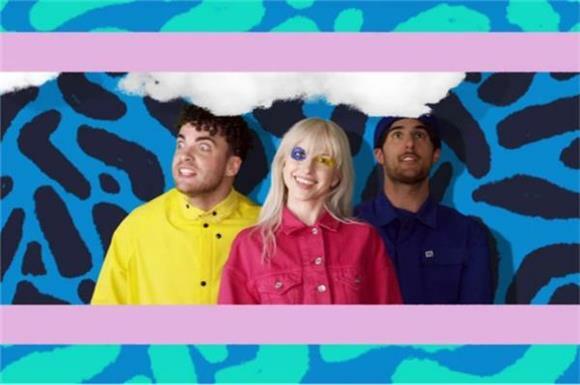 Check out the video for 'Hard Times' above, and be on the lookout for their upcoming record After Laughter, out May 12.